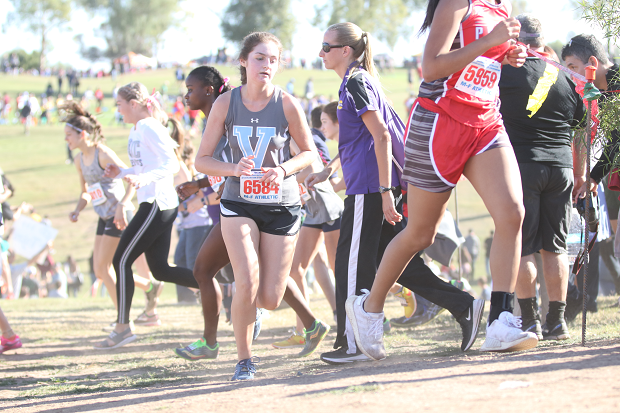 Lost in the Moment -- Isabella Smith of Veritas Preparatory Academy crests the mid-race hill at the State Meet. Side-note: Sometimes people get so caught up in supporting their athletes and teams, they forget where they are and what's going on. Though athletes racing and unleashing their passion along the course is fun for us to watch as spectators, we must also remember that this community is created in respect to the athletes. Let us remember that staying off the course until each athlete passes is for the safety and healthy development of the athletes.